One of the most frustrating problems in IVF today is failed implantation. When we transfer perfect looking embryos into a normal uterine cavity, we expect that the patient will get pregnant. When they don’t , it’s hard to figure out what the reason for the failed IVF is. We know that many Grade A embryos will have a lethal genetic abnormality which will prevent them from implanting. However, we cannot diagnose these, even with the newest genetic technology such as array CGH ( comparative genomic hybridisation) and NGS ( next generation sequencing) . This is because while these tests allows us to check for the number of shape of chromosomes, they do not allow us to screen for problems at the gene level. This is why even embryos which have been proven to be normal on CGH will still fail to implant. However , rather than fretting about all the things which we cannot control, in clinical practice it makes much more sense to can be focus on some of the things which we can improve in real life. One of the ways we can improve IVF success rates is by enhancing endometrial receptivity. This is why we monitor endometrial thickness and texture by ultrasound scanning; and this is why we provide luteal phase support after the transfer with estrogen and progesterone. One of the interventions which has been recently proposed to enhance endometrial receptivity is the technique called endometrial scratching. This is an extremely easy and inexpensive intervention , in which we injuring the uterine lining in a very controlled fashion. This might sound very counter-intuitive – why would one want to actually inflict damage on the endometrium ? Conceptually, this is like the old-fashioned D&C which gynecologists used to use in the past to “ treat “ unexplained infertility, but it’s much less invasive. 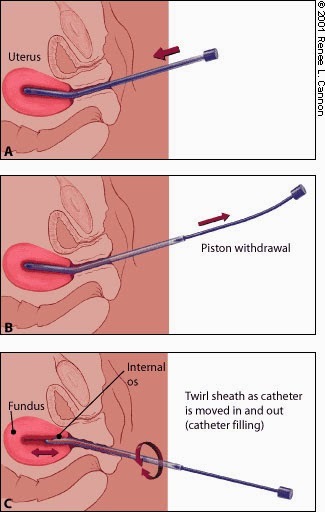 Instead of scraping the uterine lining ( as we do in a D&C), in a scratch procedure we just introduce a file plastic catheter into the uterus, in order to remove a small strip of the uterine lining. ( The additional benefit this procedure offers is that it allows us to map the cervical canal , and since it’s very similar to a dummy embryo transfer, it makes the actual ET much easier). We know that every time the body sustains an injury, the body’s healing systems mount an inflammatory response to allow the injured tissue to heal. One of the mechanisms is to increase local blood flow, and we believe that controlled endometrial scratching serves exactly the same purpose, thus allowing the uterine lining to enhance its receptivity. This is easy to do, and while it’s hard to document that this procedure improves IVF success rates because enough controlled clinical trials have still not been done, it’s worth offering to patients who have failed IVF cycles earlier, on an empirical basis. It’s a low-cost procedure, which is unlikely to cause any harm, and may be worth trying. How much gap can happen between the endometrial scratching and your next FET? Is endometrial scratching done during hysteroscopy or is it upto the dr. to do it? When is the best time to do the scratch ? What's the best instrument to do the scratch with ? We use a plastic Pipelle catheter and do this 2-3 days after the period is over. I do not think that the positive effect of ( if at all there is anything ! ) endometrial scratch is due to increased blood flow. The scratch creates a wound or local inflammation. In order to repair it several immune cells and circulating stem cells rush to that place. Imagine a cut in the skin and what happens - the wound healing process. Both the immune cells and stem cells which gets there to repair the wound secretes numerous cytokines and growth factors which must have a beneficial effect in promoting implantation. If this is so, doing an endometrial scratch not at the beginning of the cycle but few days before transferring the embryo must give the maximum benefit. Is it possible to scratch the endometrium couple of days before ET ? Part of the inflammatory response to injury is an increased blood flow as well as increased local production of growth factors. We still don't know the mechanism. Yes, we can do the scratch 2 days prior to the ET as well. I would like to know whether the endometrium scratch decreases the thickness too? As some layer of the endometrium is removed. If it decreases the thickness, won't it be detrimental if done just before ET? My scratch happened on 16th day of my cycle & have been asked to come on day 2 of my cycle for antagonist Ivf procedure...is it true procedure? If the chances of higher for IVF with scratching procedure, why cant't this procedure be done at the first time itself, rather than after unsuccessful attempts ??? I had two failed frozen embryo transfer. Before FET I had OHSS . I have still 2 2 BC quality embryo left.I have lost faith in my doctor. Is this a good idea to go for a fresh cycle with other doctor in India or should have another FET in London?If India is ok then how you can help me with repetitive implantation failure? Do you have PCOD ?